Golden raspberries give your baking a gourmet look, and this is one of the best tasting golden raspberries we've ever tasted. The flavor is actually just as unique as the color, it's very sweet with a slight hint of apricot. This is an "everbearing" or "fall-bearing" cultivar, so it bears fruit a little later in the season than other varieties, sometimes into fall. 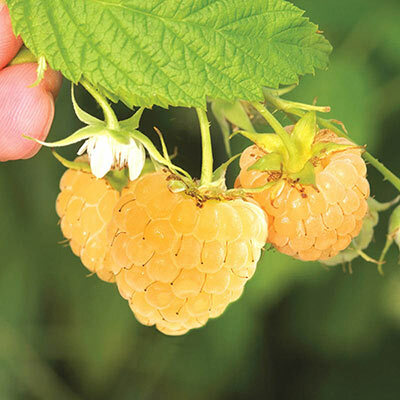 It'll extend your berry season nicely, or if you want a mix of red and gold, we suggest growing heritage raspberry alongside it. Anne Yellow has a great yield of large berries. Self-pollinating. Rubus occidentalis 'Anne' PP10411 While you're harvesting berries, don't forget to snip a few stems of foliage for your fresh-cut bouquets. The lovely, heavily-veined leaves are produced in high quantity, and make very long-lasting foliage filler in a vase. Flowering Date: Late spring-Early summer, producing fruit early summer through fall. Winter Care: A winter mulch is recommended in colder climates, remove in early spring. Flower Form: Small, single, rose-like. Pruning: Prune back to 8-12 buds on each cane. Prune thin canes, leaving the thickest at least 4-6" apart. Early spring. Soil Requirement: Tolerant of a wide range of soil types, will do best in a well-drained, humus enriched soil. 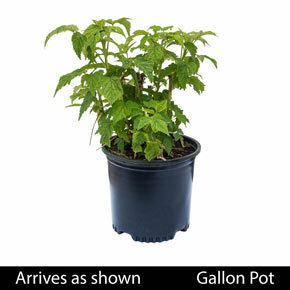 Watering Requirement: Requires average water needs, water regulary, do not overwater.